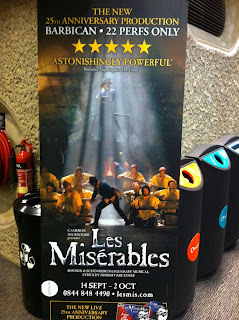 Last night Stu, Fay, Andy and I went to see Les Misérables at the Barbican Theatre. Oh, my giddy aunt - what a show! We are all big fans but nothing had quite prepared us for what we saw. It was breath-taking. We cried with joy and pain. It was the brand new 25th anniversary production of Boublil and Schönberg's legendary musical with glorious new staging and spectacular reimagined scenery inspired by the paintings of Victor Hugo. The musical actually started out at the Barbican Theatre way back in 1985. And apparently this is the first time anywhere in the world that two productions of the same musical are playing in the same city. Well we just loved it - from the moving (both senses) back-projection to the great set, from the fabulous acting to the great singing. There were show-stoppers aplenty (including one perhaps not on the running order). We had great seats too! If you get a chance, go.